I have been teaching private lessons in guitar for over 10 years, specializing in Classical and Flamenco styles. All ages and skill levels are welcome! Lessons are customized and catered to the needs of each student. I'm looking forward to helping you achieve your goals! My name is Victor, and I would love to help you further your skills and love for guitar! I have a Master's degree in Guitar Performance -- emphasis on Classical and Flamenco -- from the University of Texas Rio Grande Valley. I have been providing private lessons in guitar for over 10 years for students of all ages and skill levels. I also perform and gig regularly. In my career, I have played several well known pieces, such as Entre Dos Aguas by Paco De Lucia, Asturias by Isaac Albeniz, and Recuerdos De La Alhambra by Francisco Tarrega. Lesson plans are tailored to the student's needs and goals, which can be anything from learning how to read music, learning how to play by ear, furthering one's technique, etc. In lessons with me, you can expect to develop the basics of proper classical techniques, all the way to mastery, enabling you to play fast and precise. My goal as a teacher is to develop a strong foundation to allow students to eventually learn songs on their own with ease. I strive to create a fun environment to foster learning and keep students engaged in the task at hand. My schedule is flexible and I am open to lessons at my home, your home, or online. I can't wait to get started! In this position I had the privilege of assisting Dr. Kurt Martinez in teaching undergraduate guitar courses and undergraduate music majors as well. I developed lesson plans for beginner students who were not music majors and taught the fundamentals of guitar technique and how to read musical notation for the guitar. Other courses I instructed include guitar methods, which is the pedogogical approach to teaching guitar in a classroom setting, and applied guitar, which is a guitar major or minor's private lesson where the goal is to learn several pieces throughout the semester while simultaneously improving technique, music reading level, and musicality. Instructed students in Classical and Flamenco guitar. Guided students in learning the required technique and material for high school and college guitar programs auditions. Provided lessons to students from the ages of 4-16. Taught music theory, guitar pedagogy, and guitar music in various styles. After a semester of studying, all students participated in a recital where they played in duets, quartets, ensembles, and solos. Performed traditional wedding music on solo guitar. Accompanied flamenco dance performance at UTRGV. Performed for Judicael Perroy in a masterclass at 'Dia de la Guitarra' guitar festival. Warming up before a recital. 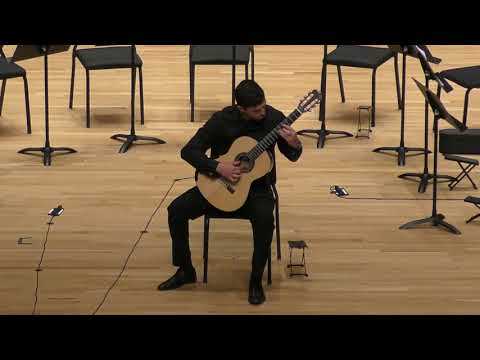 Performing in the UTRGV guitar studio recital. Victor has been coming to our home to teach my 12-year-old daughter the piano and guitar. He’s done well not only to teach her to play and write music but has imparted great enthusiasm in her for playing the instruments . I would highly recommend him for the position.